This book is for system administrators who are into VMware administration and are looking to automate their infrastructure. Basic knowledge about programming is needed. No previous knowledge of Orchestrator is required. This book will also be good for you if you have just a basic knowledge with vRealize Orchestrator, as you can pick up any recipe and implement it for your enterprise. 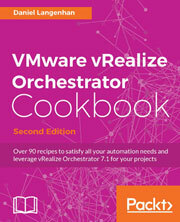 This practical guide provides exciting and practical recipes on VMware vRealize Orchestrator 7 for those who are waiting to automate their infrastructure.